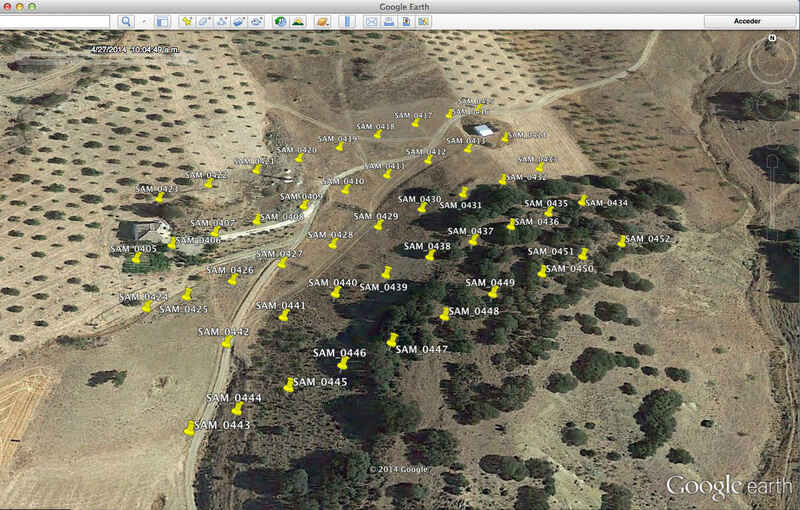 This article shows how to Geo-tag images, using Mission Planner to inject data from telemetry logs into their EXIF tags. 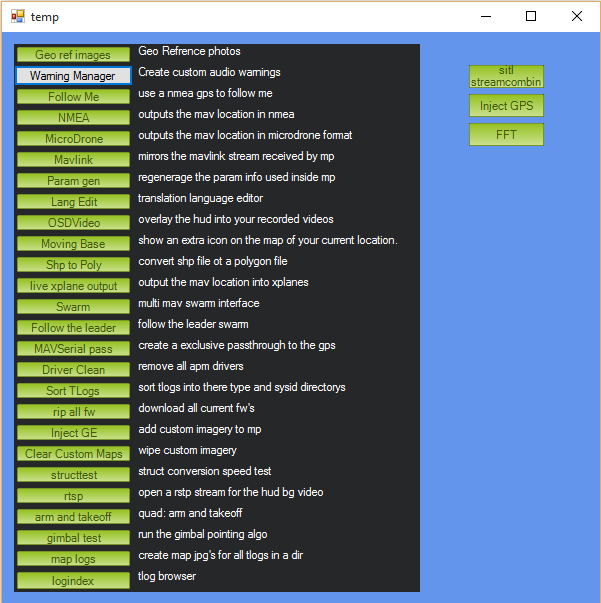 Geo-tagging images makes it easier to photo-merge the many pictures taken during a camera mission, and is important for applications including photogrammetry, orthophoto generation, 3D terrain modeling etc. ArduPilot can trigger a camera during pre-programmed missions or by RC activation using the DO_DIGICAM_CONTROL or DO_SET_CAM_TRIGG_DIST commands. 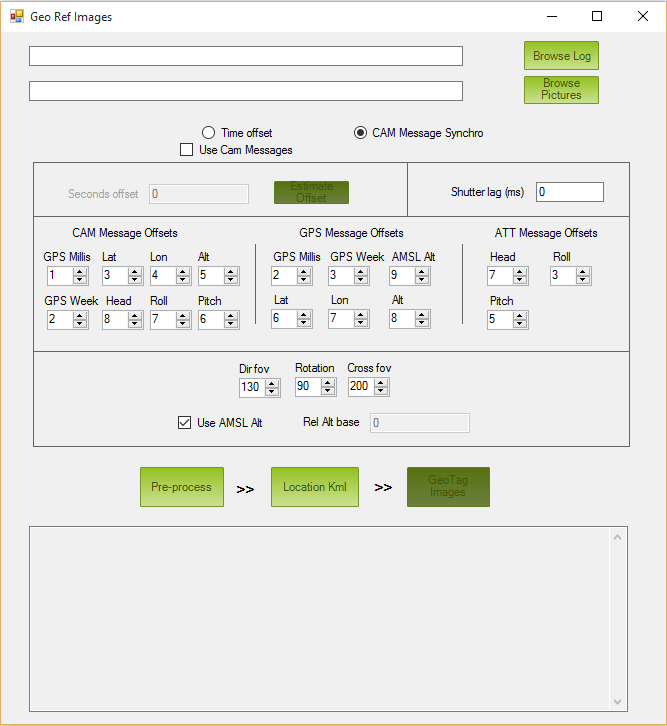 Corresponding CAM messages are stored in the dataflash log, and can be used by Mission Planner to add accurate geotag information to images. This method uses the time difference between the camera internal clock and system clock to determine where in the log each image was taken and get the GPS information. Typically users must tune the offset value in order to find a sensible result. connection between camera and autopilot. Even if your camera has a built-in GPS you may find this approach provide more accurate information than the built-in GPS. Open Mission Planner and press Ctrl+F. This will open a hidden screen like the one shown below. Click the button Browse Log and select the log (.tlog or .log) of the flight related to the shooting session. Click the button Browse Directory and select the folder where your aerial pictures were downloaded from your camera. Notice that the camera picture folder can contain other files apart from the pictures. However in terms of pictures, it must contain just the ones belonging to the flight. The next steps depend on whether you’re using CAM Messages or a time offset. 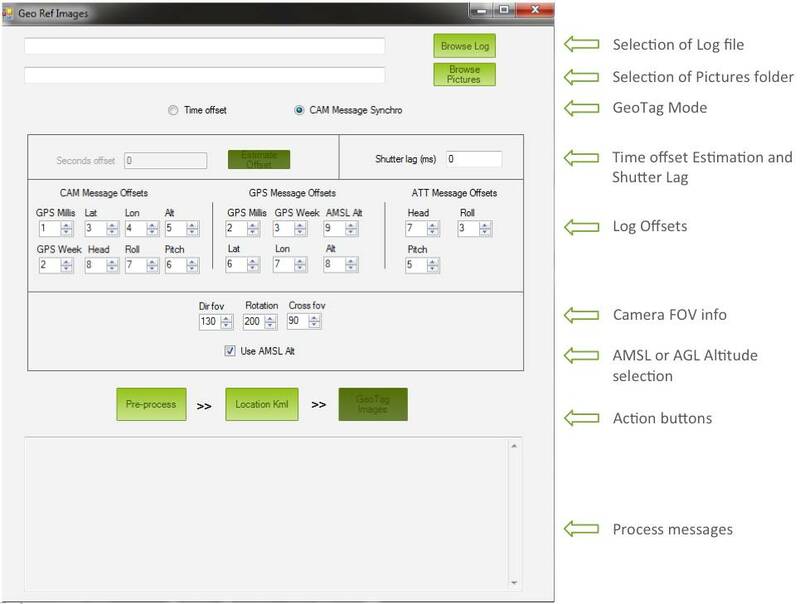 In order to process CAM messages, the mission file had to be defined to use remote camera trigger by means of any of the available mission commands (CAM_TRIGG_DISTANCE, DO_DIGICAM_CONTROL, etc). Select the CAM Message method if it is not selected in the Geotag Mode section. If pre-processing works correctly, you will see Done displayed at the end of the Process Messages Area. 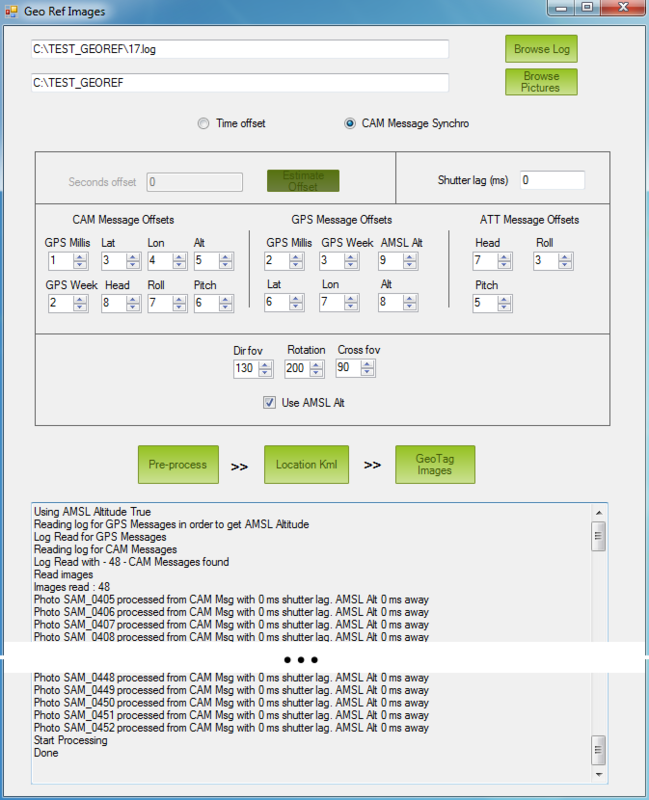 The most common problem in this processing mode is having a discrepancy between the number of CAM messages in log and the number of pictures in the folder. If the tool finds that they are different, it will output an error message and abort. The final step is to “sanity check” the proposed picture location using the Location Kml button (See Common Post-steps below). If you haven’t flown yet, one useful trick is to synchronize camera and system time. Select the Time Offset method if it is not selected in the Geotag Mode section. 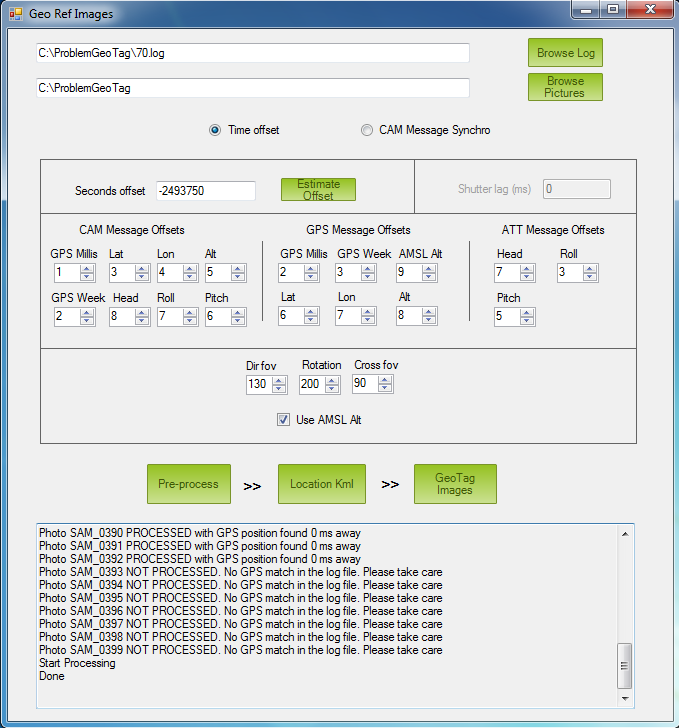 The tool will calculate (as explained in previous section) the time difference between the first picture and the first GPS time in the log. The most common problem when using this method is the use of an inaccurate time offset. Remember that the estimated time offset is just a starting point! The final step is to “sanity check” the proposed picture location using the Location Kml button (See Common Post-steps below). If the proposed locations are not correct, add or subtract some seconds to the Offset Time and repeat. Check that they are OK. If you used CAM Message mode, there shouldn’t be any problem (iIf there is, just order pictures alphabetically and check that the first picture in the list is also the oldest one). If you used Time Offset, just try adding or subtracting seconds to time offset. If everything is OK, click on GeoTag Images button and wait to see the processing message Geo tagging FINISHED. As explained above, there are two options. CAM Messages and Time offset. This section is only relevant if Time Offset mode has been selected. If CAM Message is selected, the Shutter Lag option is available. 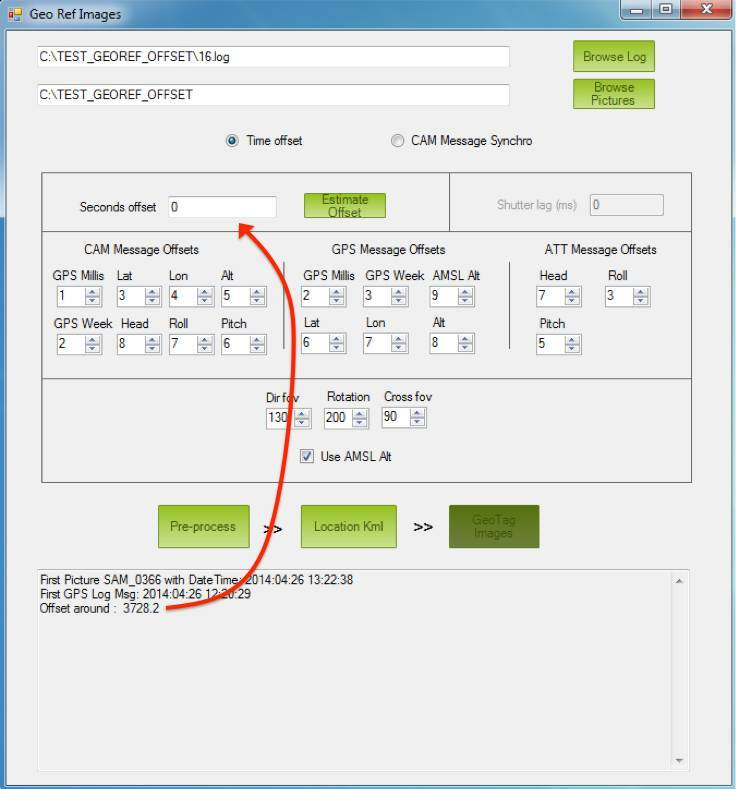 Note that GPS positions are stored at 5Hz by default (if using 3DR GPS) so they are recorded every 200ms. If Shutter Lag is less than 100ms, then GPS position is taken from current CAM Message. If Shutter Lag is bigger than 100ms, the GPS position is taken from 200ms ahead in log. Item offsets are preset to the values for the last stable APM release. The field with the number 1 is the one after the Units-definition-word. This is where the user can define the Field of View (FOV) and orientation information. This information is incorporated into the result files but it is not used or stored in the picture EXIF data. The AMSL Alt checkbox allows to select either AGL Altitude (Above Ground Level) or AMSL Altitude (Above Mean Sea Level). Location Kml - When this button is clicked, Geotag tool will open Google Earth and show pictures position on a map so the user can check their correct positioning. With the appropriate mission from Mission Planner(or similar), DROTAGx (airborneprojects.com) enables APM compatible Flight Controllers (like Pixhawk) to Trigger and Geo-Tag your Digital Camera pictures in the air. It works through one of the available TELEMETRY ports and through a microUSB cable to the camera. You will have your taken pictures automatically Geo-Tagged by DROTAGx in the microSD card inside your camera at the time you land, with no need for any post-processing. Photo tagging directly on the camera card itself. Have a plain text log file with geographical data in the camera card itself. Includes Yaw, Roll, and Pitch of the Drone. 1 Picture every 1.6 seconds. Guaranteed correct tagging even if the camera misses several pictures in a row! Hotshoe for camera flash feedback included for cameras with external flash. With the hotshoe installed take pictures as fast as your camera allows for, and microsecond accurate shutter lag. Airborne Project’s also provides a comprehensive DROTAGx manual (airborneprojects.com) with before flight checklists, detailed explanations for diagnosis and other tips. DROTAGx is used by several national governmental organizations including Land Management Organizations around the world. Many professional surveying companies also choose the DROTAG for their tagging needs. This tutorial was created to show you how does it work. Original work from Sandro Benigno and Guto Santaella updated by Jesus Alvarez.